Wilmington is home to the original Little Dipper. The idea for this restaurant was developed from a love of fondue which is highly matched by our love of Historic Downtown Wilmington and its surrounding beaches and community. The building was established in 1937, so along with such a rich history came a total up fit of interior design that would recreate a bright, modern, but cozy feeling while maintaining the integrity of the old building. Happily, The Little Dipper hung its hand-carved sign and opened the doors July 15, 2005. Check out our full course menu which includes a cheese fondue appetizer for the table to share, salads or soups, entrees to be cooked at the table and chocolate fondue as an additional course to button up the meal. In addition to the full course menu we offer an a la’ carte version including our cheese appetizers, salads, various grilled meats and seafood and dessert fondues which can all be enjoyed in the bar beside the jellyfish tank or outside on the back deck when the weather is warm. We have two options for large groups because all of our tables are stationary. Click on thumbnails to view. seats up to 29 people comfortably, but maxes out at a tight 30.
seats up to 46 people, with a mixed configuration. This is really the main dining room that could be booked for one large party that wouldn't be concerned with the partitions separating various tables for privacy. This would be a mixed table configuration with varying sizes. The largest table we can seat in this area is eight with two burners or two tables next to each other for a group of ten providing three burners for the group. All of the other tables are separate throughout the dining room. We also offer a few private tables for a more intimate setting. Yes, we have a beautiful back deck with a special a la' carte menu and drinks for parties of any size. We do not reserve the outside tables, unless it's a special promotional event, so please come and enjoy at any time. Please note that we do not have the ability to offer the full menu outside as the tables do not have burners built into them, but our a la' carte menu is a great option for a nice meal including cheese fondue, salads some grilled items and chocolate fondue. The deck is also a great place for large groups to begin an event with cheese fondue and cocktails or a great ending with the chocolate fondue fountain under the stars. The deck is uncovered and not heated/air conditioned. It is traditionally open April (Azalea Festival kickoff) - October (River Festival), please dress appropriately as we cannot guarantee a free table inside at all times. Check out our live music schedule outside as well, offered Friday and Saturday Nights throughout the season and Mondays, Memorial Day-Labor Day. Yes, we do offer gift certificates. We currently do not sell gift cards online, however we can take orders over the phone with a credit card and mail them anywhere for just $1. Give us a call at 910.251.0433. 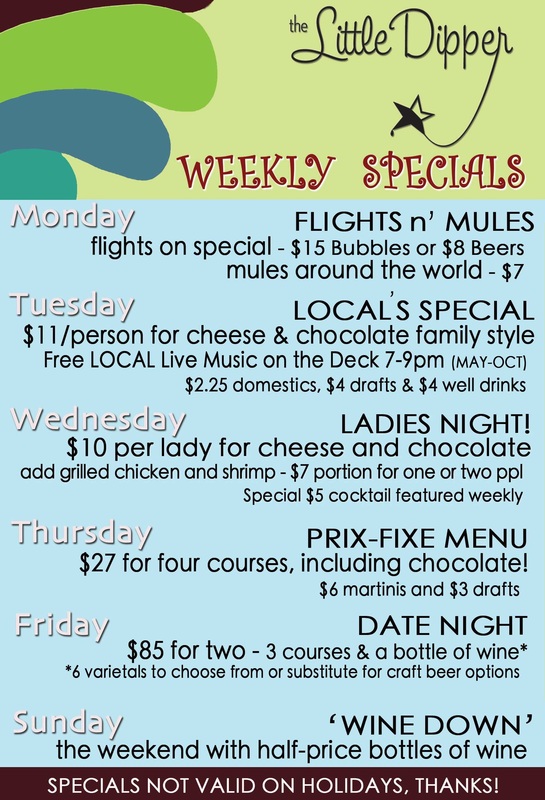 FLIGHTS n’MULES flights on special! Flights of beer are $8, flights of bubbles are $15, and hand crafted mules are made with your choice liquor for $7! As a thanks to our loyal local customers we offer cheese and chocolate for $11 per person for the table to share. Enjoy great drink specials as well including $2.25 domestics, $4 drafts & $4 well drinks. Shop local, drink local and support your neighbors! Come out with the girls and get cheese and chocolate for $10 per person for the table to share. 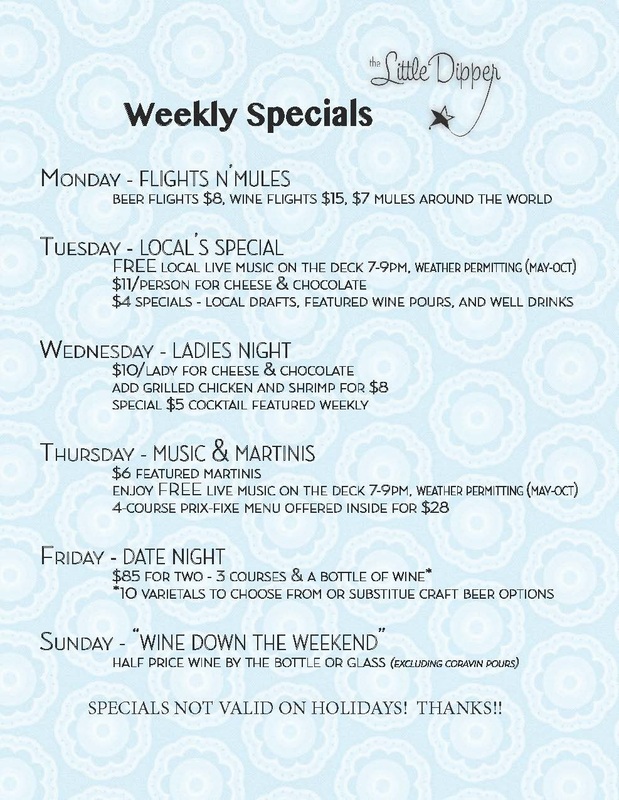 Add grilled chicken and shrimp for $7, and check out our weekly $5 featured cocktail!! We offer a four-course prix-fixe menu for $27 per person! $6 martinis and $3 drafts. Date Night! - $85 for two including a bottle of wine and three courses - cheese, entree and chocolate! Bring your girlfriend, husband, mom or friend... just bring a date! Take 50% off most wines on our list! Take a left on South Front Street (one street before the river). Go two blocks south and the restaurant is on the right, the corner of S. Front and Orange. (headed downtown on the parkway) As the parkway ends it will become third street. Keep going south on third street, which will intersect Market, a main line into downtown. Take the second right after Market onto Orange Street, and go two blocks down where Orange intersects S. Front and the restaurant is just ahead on the right corner. When coming across the bridge get in the right hand lane because there is an exit for Front Street at the bottom of the bridge that you will take. The exit ramp will take you north on Front Street, keep going about a mile and the restaurant is on the left at the corner of S. Front and Orange. At the traffic light in front of Greenfield Lake bear left onto Front Street. Heading north on Front Street drive about 2.5 miles and the restaurant will be on the left at the corner of S. Front and Orange. Please use this feature for suggestions or comments. For immediate needs please give us a call and we’ll be happy to help you over the phone, 910-251-0433. "One of the best of Wilmington. Great place to meet friends and enjoy some excellent food. Classy and casual." "A very fun place to go with a small group. Excellent service and fondue! I highly recommend the half and half chocolate fondue (half chocolate and half peanut butter). The Little Dipper is a great place to go when you feel like cheese and chocolate for dinner!" "The Little Dipper is an entirely different league, especially when it comes to the quality of ingredients. I love all their different sauces, especially the green curry. You can come with a big group or sit at a quiet table for two or even take in the outside air on their huge patio. Everything about this place is top notch (Aquarium of glowing jellyfish!). I've been here many times over the past few years. Highly highly recommend!" "The food was all really good. The au pouivre was an amazing complement to the filet. It was cooked in a broth. This place would be an awesome date place, the way some of the tables are set up. I didn't have any dessert, was too full to eat anything else. But this place was the best place I was able to eat at in Wilmington. So if you're visiting make sure to come check this place out!" "Hooray for me and hooray for The Little Dipper. I ate way too much, but that's only because it was sooo good." "Gosh... this place is so special. When my wife asks where I'd like to go for my birthday I always say Little Dipper. The food is awesome, the staff is great, and you get a lot for the price. It makes me smile just to think about this place while I write this review." "Fifth anniversary surprise. This place is unreal. It's far cheaper than Melting Pot, it's not a chain and the food is delicious." "Check out The Little Dipper, my date scored it 30 out of 10 at the end of the night; definitively perfection in the art of fondue. The best night out in such a long time, PLEASE CHECK THIS PLACE OUT well worth it." "I have not been able to find a comparable fondue place in such foodie cities as San Francisco or Chicago. Now that I live in Chicago I miss you, Little Dipper! " "My favorite place in town! The food is wonderful to put it mildly, so many combinations and it's not too heavy. Save room for dessert! Drinks are fabulous and the staff is always on top of their game. I'm confident every time we go, that it will be a great experience and we will be very VERY full when we leave"